Yellowstone’s Grand Canyon runs for about 20 miles, but the best part is around Upper and Lower Falls (109 and 308 feet respectively), very close to Canyon Lodge where we were staying. We spent two full days hiking the various trails around the rim. From Red Rock Point, we drove round to Artist Point on the South Rim. The trail from here to Point Sublime displayed the multi-hued rocks of the canyon to perfection. We then followed the Ribbon Lake Trail – lots of bird life here. My Fitbit measured over 30,000 steps that day – the first and only time this has happened! On our second day in the Canyon, we returned to Artist Point and hiked a loop, taking in the South Rim and Clear Lake Trails, which provided an amazing variety of scenery. From Artist Point we set off on the South Rim Trail. As we walked along the canyon edge, we could see the North Rim viewpoints we had visited a few days before – Red Rock Point and Brink of Lower Falls. 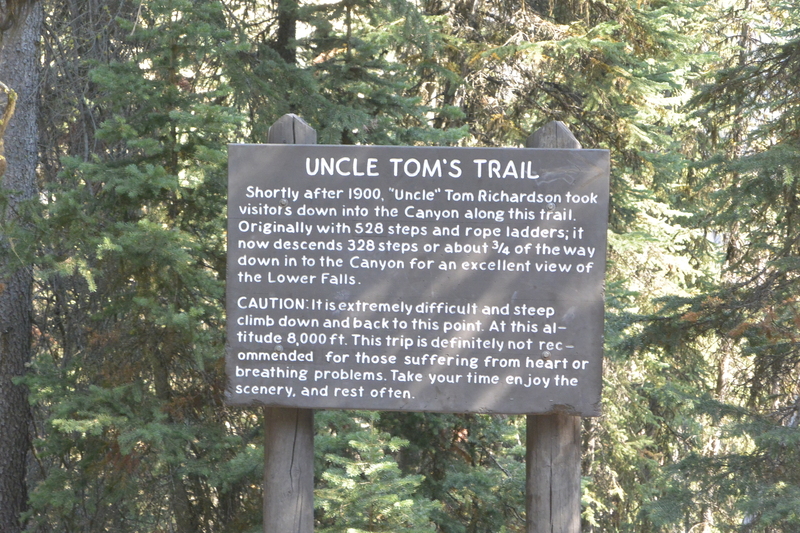 Just before we reached the falls, we came to a diversion at Uncle Tom’s Trail. Now rope ladders would have been beyond me, but steps I can manage. I won’t pretend that I wasn’t completely out of breath by the time I got back to the top though! We continued along the South Rim past Upper Falls before re-joining the road at the Wapiti Lake Trailhead where we had our picnic. From the other end of the trailhead, Clear Lake Trail led off and the scenery changed completely. First, there was an open meadow to cross. Eventually, the smell of sulphur assaulted our nostrils and we emerged from a small patch of forest to find the hydrothermal area of Clear Lake with acid-bleached driftwood and boiling mudpots – a complete contrast in its desolation. Eventually, we met Ribbon Lake Trail again and had the same walk back to Artist Point as on Day 1. It seems no-one can resist photographing the canyon walls. Yellowstone surprises round every corner. In this small area we encountered painted cliffs, waterfalls, meadows, sulphurous lakes and boiling mudpots. Could it get any more amazing? Well, maybe it could – next up, Mammoth Springs! In the meantime, this post is linked to Jo’s Monday Walks. Hop over there for blue Portuguese skies and a selection of other cyber-rambling. It is absolutely amazing. We always hear about Yellowstone, but honestly I had never fully understand why it is so popular. Well, I’d say it isn’t jus tpopular, it’s also a beautiful patch of our word. Thanks so much for sharing this experience. Even better to come! Eventually. I’ve lost my blogging mojo a bit at the moment. Oh definitely go when you can – it’s one of the most amazing places I’ve seen. So hard to have a preference for one part of Yellowstone versus another, but after seeing all those otherworldly hot spring pools and geysers, the Grand Canyon and its amazing waterfall was just an astonishing sight. Happy the two of you enjoyed it too. Also, there is no age limit to being adventurous! I agree – totally impossible to choose a favourite part of Yellowstone!